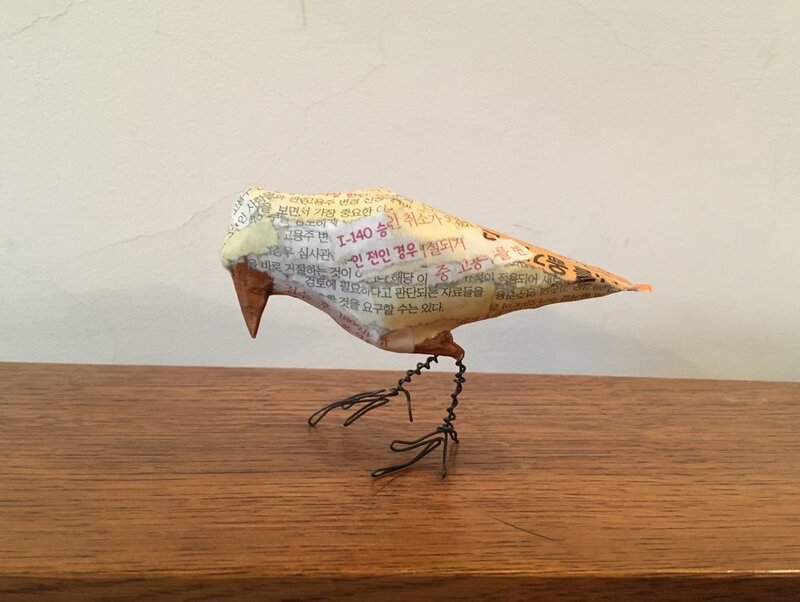 This bird is covered with the paper insert from an Advair asthma inhaler. My husband and daughter both have asthma and use an inhaler occasionally, so it is easy for me to collect the inserts and they have been a part of my life for many years now. I am fascinated with the long lists of symptoms and side effects on medical inserts, as well as the chemical structures they sometimes include. It seemed obvious to use the inserts to cover birds - canaries in a coal mine, as it were, for various common diseases and medical conditions. But when I started finding empty cigarette packs in my neighborhood, I made the (perhaps obvious) connection between Eric Garner and the asthma inhaler inserts. So I created a pedestal out of the empty packs, turning the Advair bird into a monument to invisible, and sometimes deadly, afflictions (physical or societal). Who knows whether Eric Garner would have survived being choked by the police if he hadn't had asthma. But he was supposedly selling cigarettes illegally when he was stopped by police. And, ironically, he suffered from asthma and was already out of breath from reportedly helping break up a fight earlier. His obesity added to the stress on his body, as well. But beyond the literal connections among cigarettes, asthma, and inhalers, I find myself thinking often recently about Eric Garner's death while repeatedly saying "I can't breathe." It is a metaphor for the overwhelming odds against success that many black men face in the US. Pressures, literal and figurative, on their bodies and minds make it so difficult for them to be seen for who they are and live as accepted and respected beings in a society that seems to be looking only for reasons to fear them. What was originally intended to be a simpler piece about the beauty and mystery of languages written in unfamiliar alphabets has become an acknowledgement of the hurdles immigrants to the US have to overcome through both spoken and written language. 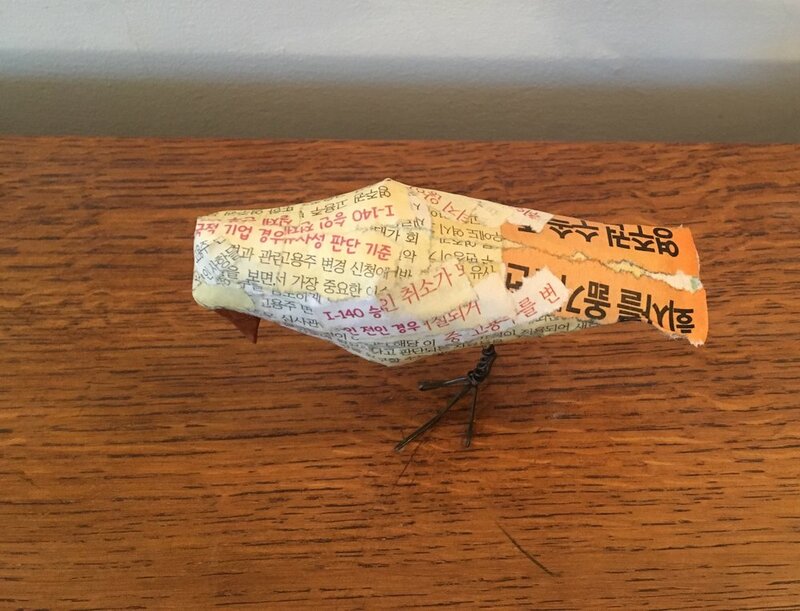 I was just going to make a bird covered with Korean Hangul writing from a found newspaper, but while I was looking for a visually compelling portion of characters, I found a full-page ad(?) or article(?) about immigration to the US. The Arabic numerals sprinkled throughout (and appearing occasionally on this bird) are US immigration form numbers. The header was in English, otherwise, I wouldn’t have known the topic, since I couldn’t read anything else. And so, this is also a meditation on presumptions the locally dominant(?) culture makes about interactions w other cultures in our community and the privilege of those who speak and read English in this country (even if it is the only language they speak and whether or not that is wise). Theoretically, this kanji stone is a calligraphic symbol for "chaos." It may be the symbol "chun" ("difficulty at the beginning") from the I Ching. 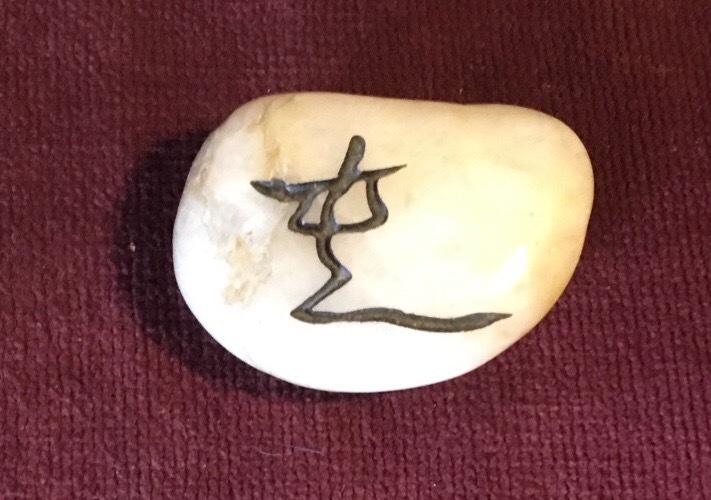 I carry this stone in my pocket, in part because of what I have been told it means (even if that is incorrect), but also because of how it symbolizes how we personalize the things in our world to suit our needs. Even if this symbol is invented and means nothing in its advertised context, it does its job - reminding me to accept chaos. Simplicity. Even though I tell myself that it is the goal, I find that I am drawn toward complexity instead. Clarity, for me, lies in acknowledging the chaos and the intertwined nature of things and pursuits, rather than trying to separate them and hone down to their essence. This site is actually my second art site. I can't shed the first one - jbeelsdesign.com - because I still make that work. But it occupies a different part of my brain and my practice. So, instead of presenting a clear, branded body of work, I have opted to distract and pile on the information. As usual. The stone in the image above distills many aspects of my work. It is a single object, probably created by someone who only knows a little about the philosophy or culture the symbol comes from, that grabs onto an appealing idea and spits it out into yet another context. Among may options for ideas to be guided by, I glommed onto it since, rather than be guided by a stone that says "love" or "peace" (both totally worthy goals), I'd rather be reminded that control is not really possible, just acceptance and acknowledgement of the chaos around us. In life, I look for patterns and bits of understanding, common references or impulses, but acknowledge that my focus will change, the context will change, the material world will change, and that is all OK. In my work, I revel in finding news ways to look at moments in the world, as it changes - ways to capture common points of interest or twist familiar information to make the world shine more brightly.